Following the Award-winning Pep Guardiola’s arrival at Allianz Arena, the holy man of Tiki-taka doctrine has been under immense pressure by Bayern Munich fans, and former icons of the club in recent months. The team’s lengthy triangular passing, rather than a quick counterattack is a style Bayern Munich are not used to. Just recently, Pep Guardiola was booed by a section of the Bayern Munich support ahead of their pre-season friendly against Real Madrid. That dissent followed former Bayern Munich star, Steven Effenberg’s prediction, “I am pretty certain Guardiola will no longer be in charge of Bayern after 2016,” said former Bayern star, in an interview with Sky Sports. After all, Bayern Munich fans are quite familiar with Bundesliga title win. They have pride in their club for 24 league championship in Bundesliga’s history, higher than any other German club. Their Spanish coach too has delivered on all top-level Championships for the club except UEFA Champions League. Having won two championships, one DFB Cup, one Club World Cup and the European Super Cup, and having made two semifinal appearances in the Champions League with Bayern, the 44-year-old has provided a better return than any other top-level manager over the course of the past two seasons. In contrast to Bayern Munich fans, Bayern’s senior officials regularly claim the Bundesliga title remains the priority each season, but Guardiola was brought in to bring Champions League glory to the Bavarians. To put Bayern Munich’s Champions league performance in perspective, in the last 10 years of UEFA Champions league tournaments, Bayern Munich has won 1 trophy, and that was under former retiring manager, Heynckes. Their 2013 Champions league trophy came after a lengthy wait since year 2000. In the same period, Bayern Munich’s trophy record is in par with Real Madrid, Chelsea, Manchester United, AC Milan and Inter Milan with 1 European title in their trophy cabinets. The only club that has won more Champions League trophies is FC Barcelona. Although the historic data does not look bad on Bayern Munich, the club fans clearly do not tolerate being under the shadows of FC Barcelona in terms of European glories. So far, Pep Guardiola’s quest for Champions League trophy has been fruitless. In the last 2 seasons, the club bowed out at Semifinals, most notably, humiliating 5-0 loss at the hands of Real Madrid. Pep Guardiola though, could keep his bosses’ unforgiving attitude in mind. Back in 2010, Luis Van Gaal in his 2 year term managed to take Bayern Munich into the Finals of UEFA Champions League, ending with a runner-up position. Yet, the following season, Round of 16 exit and poor record at Bundesliga cost his job immediately. The question is, what exactly do Bayern Munich fans expect from Guardiola this season? Do Bayern Munich fans expect nothing less than Champions League trophy? Or an improvement in Bayern Munich’s spot to, say a Runner-up would be good enough this season? Does a Semi-final spot – A promise by Pep Guardiola and the same spot as last season- would guarantee him his pink-slip? If Bayern Munich fans expect nothing less than Champions League trophy, Pep Guardiola’s survival at Bayern Munich may look slim. Since Barcelona looks as strong as ever, alongside Juventus and Chelsea. But if Bayern Munich fans expect an improvement from Semi-final finish to either Runner-up or Championship at UEFA Champions League, one should look at history of Bayern Munich in comparison to other European opponents in the Final of the tournament. In the first chart, Bayern Munich’s Runner-up position at UEFA Champions League is compared against other club since the beginning of European Cup/Champions League formation, which was 1955-1956 season): In the history of Champions League, Bayern Munich has made it to the Final of the Tournament 5 times; Only one appearance fewer than Juventus. While the usual contenders such as Real Madrid, Barcelona and AC Milan trail Bayern Munich in that aspect. In the second chart, Bayern Munich’s Champions League trophy count is compared to other teams. Bayern Munich has won Champions League 5 times in the Tournament’s history. Interestingly, they are tied with Barcelona and Liverpool in that aspect. Real Madrid leads the list with 10 European trophies, followed by AC Milan with 7 titles. 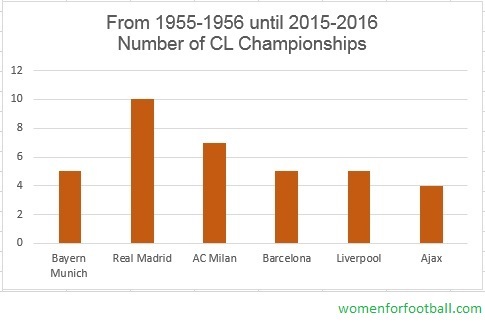 Therefore, in general, although FC Barcelona has done extremely well in recent years, Bayern Munich is still in par with Barcelona in terms of number of Champions League titles. 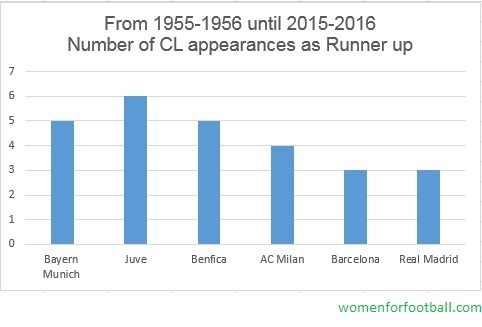 Although one could argue, Barcelona’s dominance in Champions League in recent years is more important than early years of the Tournament. To put everything into perspective, Pep Guardiola has won more trophies than any another Bayern Munich manager in his 2 seasons in charge; Of which, 2 Semi-final finish at Champions League. The question is, whether or not Bayern Munich fans will run impatient if they do not see an improvement in Bayern Munich’s Champions League spot this season. As Bayern Munich officials have proven numerous times before, any small slip-up in the club’s results, along with fans’ pressure, would end with an immediate dismissal of the manager. Even if that manager is the most prolific manager in Spain and Champions League.